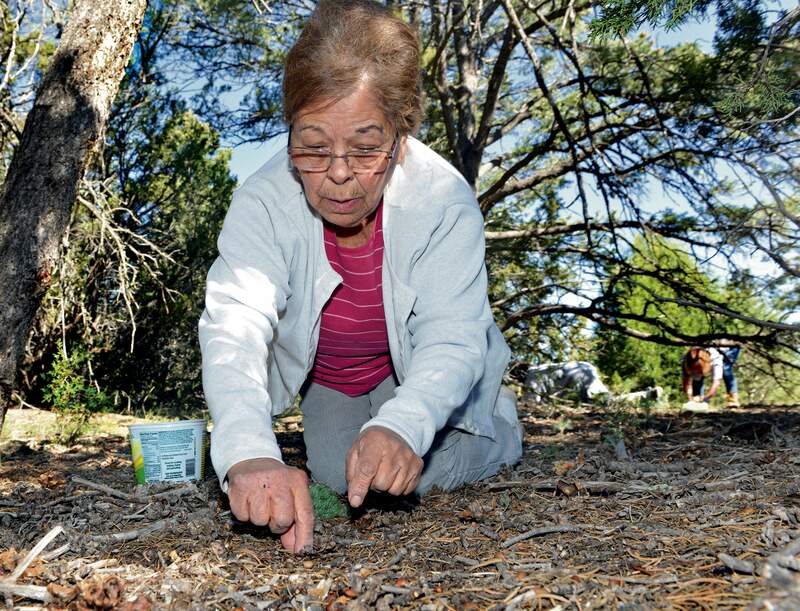 Joyce Sandoval, of Santa Fe, N.M., holds pinion nuts she harvested in Pecos, N.M. Sandoval has harvested pinion nuts for decades and says it therapeutic and relaxing. Joyce Sandoval of Santa Fe harvests piñon nuts in Pecos, N.M. Sandoval has harvested piñon nuts for decades and says it’s therapeutic and relaxing. 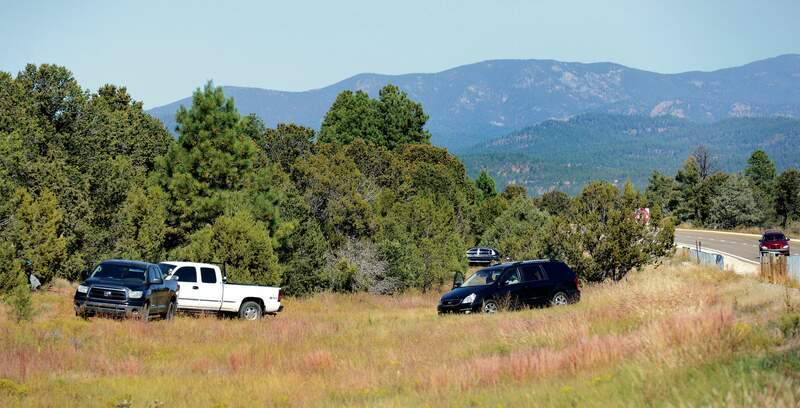 Vehicles of people harvesting piñon nuts are parked off of Interstate 25 in Pecos, N.M.
PECOS, N.M. (AP) – Mark Quintana gestures into the shady thicket of pine trees. His sons are in there somewhere, he says, along with a few of his cousins. Theirs is a familiar fall scene in northern New Mexico: Trucks parked on the roadside, tin cups and small buckets scattered beneath pine-needle boughs thick with brown cones. They’ve come for piñon. Kneeling beneath the pine trees on a cool autumn morning takes Quintana back in time. He has lost both of his parents, with whom he first came out to collect piñon when he was 10 years old. He’s making the effort, he said, to pass on the tradition. Indeed, early scouting indicates a bull market for piñon in northern New Mexico. As the air cools and daylight hours shorten, the cones of piñon pine begin to open. In the right year, after a few frosty nights, the seeds within will loosen and fall to the ground, ready to be scooped up for salting and roasting. But the savvy New Mexican understands the seasonal change doesn’t necessarily bring fresh nuts. Veteran pickers provide differing estimates on the time between passable crops. Some say it’s every two years, some say four, others say seven. Unpredictable cropAnecdotal impressions are as reliable as anything else when it comes to piñon trends. The New Mexico Department of Agriculture does not keep records on the piñon harvest. But piñon has never been a commodity to be measured, sold and tracked. For many in New Mexico, as it was for their ancestors, piñon is essential to the fabric of the land, to a sense of time, place and home. David Cuneo, owner of Albuquerque-based New Mexico Piñon Nut Co., said dry conditions have a lot to do with years-long piñon gaps. Drought signals to the tree that energy would be better directed toward subsistence and away from reproduction, he said. And the crop can be even more inconsistent depending on geography and where rain has fallen. A picker might find plentiful cones in one pocket of trees, while drawing nothing but empties, or baños, in another around the corner. But Cuneo, who has been inspecting cones across the region in the past few weeks, said optimism is broadly warranted this fall. He rates this as the best piñon crop since 2005. “Everyone will be happy. Better size, less empties. I’ve been busting open cones. I know the percentages,” he said. Cuneo identifies a few nearby hot spots where he said people would strike piñon gold: Pecos, Edgewood and north of Española and Ojo Caliente. Those willing to go a bit farther afield, he said, would find success north of Cuba, a village in Sandoval County. Julie Anne Overton, a spokeswoman for the Santa Fe National Forest, said it appears to be the second consecutive year with a good piñon crop. The Forest Service asks potential harvesters to respect boundaries with private land. “We’ve seen people cut fences, that sort of thing” in the past, she said. Penelope Gregory’s private land is fit to burst with nut-bearing cones. Her ranch, within the Rio Grande del Norte National Monument, not far from the New Mexico-Colorado border, lies in its own micro climate, she said. Rainfall is plentiful, all but assuring her a regular crop of piñon. So regular that she thought it worthwhile to pursue an organic certification for her piñon from the U.S. Department of Agriculture. An organic certifier and inspector with the state Department of Agriculture said it was the first piñon accreditation in New Mexico. “(Piñon) is a uniquely wonderful product, unique to America,” Gregory said. Now, Gregory invites piñon-seekers who pay a small fee to collect the nuts on her wild organic-certified 120 acres just south of San Antonio Mountain. Weather helpedThe market has favorable weather conditions to thank, according to data from the National Weather Service. The region is coming out of a strong El Niño and experienced a wet December, said Royce Fontenot, a senior service hydrologist in Albuquerque. Data show a rainy August helped even out northern New Mexico’s overall summer precipitation total to just about normal. Cuneo, the piñon nut retailer, said those wet conditions can make the difference between a crop that comes to fruition and one loaded with baños. Last year’s crop was decent, too, he said. “Blame it on El Niño,” he said. 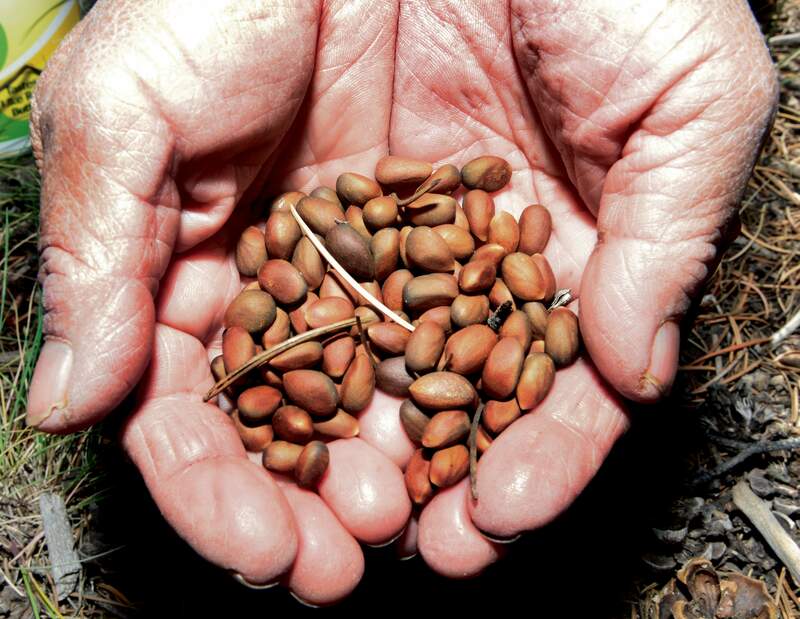 In Pecos, on National Park Service land southeast of town, Chief Ranger Scott Martin said his focus during piñon season is preservation, as well as the safety of roadside pickers. Visitors may collect up to one quart per day, Martin said, and up to 25 pounds per season, in areas not fenced off by the park. He’s keeping a close eye, but there haven’t been any egregious violations this fall. Theresa Gonzales Connaughton has lived up the hill from Old Las Vegas Highway for 38 years in a home surrounded by piñon and juniper. Last year, she said, one of her neighbors posted no-trespassing signs in the area to slow an influx of nut-seekers. When Connaughton spots these visitors, she said, she goes to introduce herself and asks them to keep some distance from her house, but otherwise lets them be. In a good year, there’s plenty to go around, she said. Picking the piñon is a tradition Connaughton’s mother passed down to her, and her mother’s mother before that. Her two young grandchildren are “really into it,” she said. If her cones show promise in a week or two, she said, they’ll come up and collect together. 120 acres of wild organic-certified piñon north of Tres Piedras, N.M. To visit, call Penelope Gregory at (575) 770-5206 or email penelopegregory@hotmail.com.